Tyler Brumfield peered into the machine to see the laser at work. “It’s kind of fun to watch,” he said. When the red light had traced the lines he’d directed, Brumfield opened the machine and pulled out the slip of cardboard. The laser had burnt a fine line around the material, but it hadn’t gone far enough. 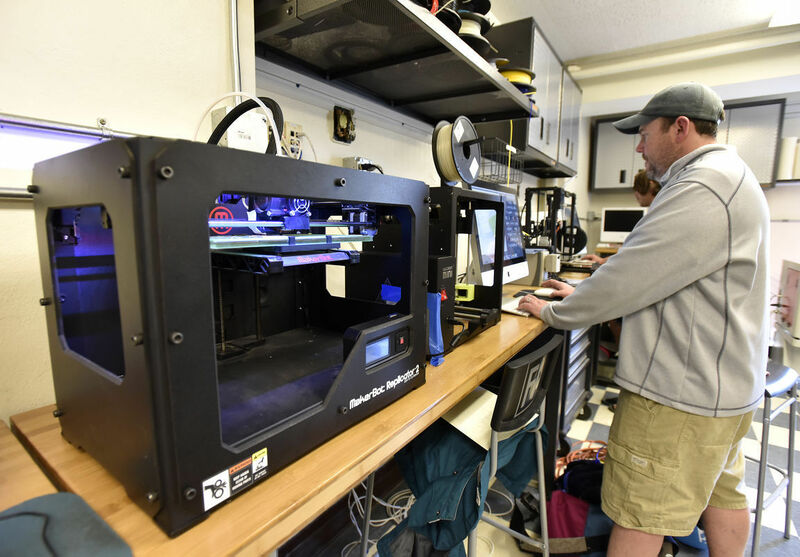 “I’ve got to bump up the power on the laser so it will cut through,” said Brumfield, a sculptor and graduate student at the University of Montana School of Art. The teacup Nahtanha Voss created started out as a warm thin smear of plastic. Voss, an undergraduate student, is working on a sculpture about memory that will include some 17 or so teacups, and she’s making them on a 3D printer. “I can’t throw pots. The last time I tried throwing, I threw my back out,” Voss said. As of last week, she’d created about eight different cups, light pieces that began out of a corn-based plastic rolled into a rope around spool. The 3D printer warmed the spool, and a nozzle laid the material in a pattern on a plate with instructions for dimensions that Voss had sent from a computer.